If you’re selling document downloads in your WooCommerce store, it’s possible to have SearchWP index the content of those documents to make it searchable for your customers! Note: this (like all document processing in SearchWP) requires that the WooCommerce Downloadable Product Downloads have been uploaded to the local WordPress Media library. 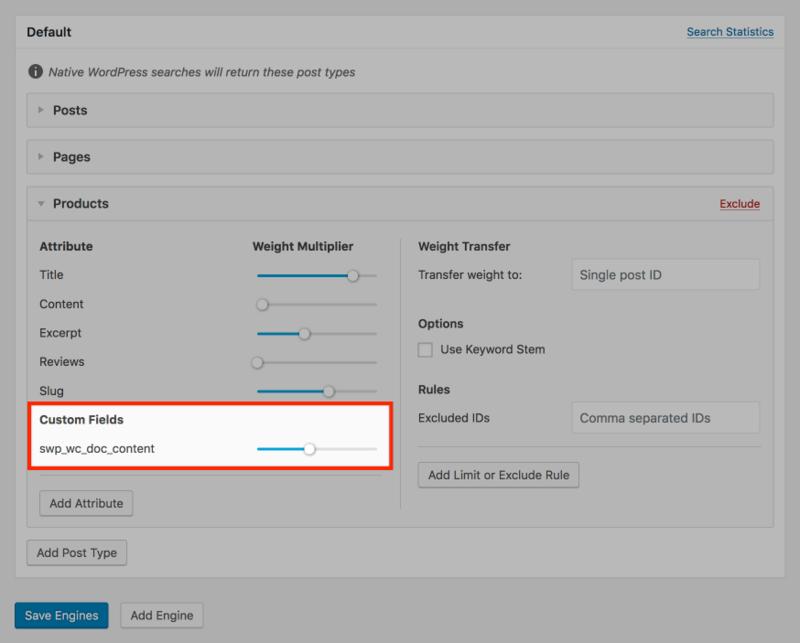 We can take advantage of SearchWP’s ability to parse and make searchable the content from readable documents stored in the WordPress Media library. This can be paired with SearchWP’s powerful ability to index ‘extra’ metadata in its own index, without affecting the data stored in WordPress’ post or postmeta table. The hook to make that happen is searchwp_extra_metadata and it’s really quite handy. Once our custom meta key that contains all of our WooCommerce Downloadable document content has been added to the search engine, you can save the engine and you’ll be prompted to rebuild the index, which is required. As each WooCommerce Product is indexed, the snippet above will be checking for downloads, and when it finds them it will utilize SearchWP’s document parser to extract the content from those downloads and add it to the swp_wc_doc_content extra meta key. Once the index is rebuilt, your customers will be able to search the content of your WooCommerce Downloadable products prior to having purchased them!